BooksBornstein, David and Susan Davis (2010), Social Entrepreneurship: What Everyone Needs to Know, New York, NY: Oxford University Press. BooksBorzaga, Carol and Jacques Defourny (eds.) 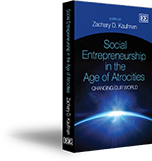 (2001), The Emergence of Social Enterprise, New York, NY: Routledge. BooksBranson, Richard (2011), Screw Business as Usual, New York, NY: Portfolio. BooksBrinckerhoff, Peter C. (2000), Social Entrepreneurship: The Art of Mission- Based Venture Development, New York, NY: Wiley. BooksBrinckerhoff, Peter C. (2012), Smart Stewardship for Nonprofits: Making the Right Decision in Good Times and Bad, Hoboken, NJ: John Wiley & Sons, Inc.
BooksBronfman, Charles and Jeffrey Solomon (2009), The Art of Giving: Where the Soul Meets a Business Plan, San Francisco, CA: Jossey-Bass. BooksBrooks, Arthur C. (2008), Social Entrepreneurship: A Modern Approach to Social Value Creation, Upper Saddle River, NJ: Prentice Hall.